Star One Realtors supports LCPL Taylor B Prazynski Walk/Run/ Roll. This year the event is Saturday, November 10. Taylor was a former student of Kim Nuxhall and volunteered in the special needs classroom while in high school. 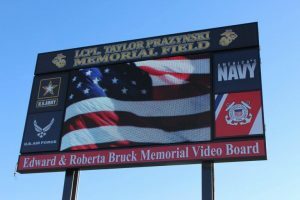 In 2003, Taylor joined the USMC; he served as a 0311 infantryman and saw gunner with the 3rd Bat/8th Marine Reg Lima Company 4th Platoon. His unit did a peacekeeping mission in Haiti 2004 and deployed to Iraq in 2005. Taylor was part of history supporting the first free election in Iraq. The momentum of September 2018 home sales slowed compared to last year’s levels, down – 7.5 % compared to September a year ago. Home sales this month were 2,109 compared to 2,280 in September 2017. “Despite September sales slowing, 2018 home sales still remain one of the top three strongest in over 10 years,” said Phil Morrical III, President of the Cincinnati Area Board of REALTORS®. “This is still a competitive market, there are plenty of buyers and the interest rates are low. Consumers wanting to sell their home need to understand that this is a great time to list your home with a Realtor,” said Morrical. The September average home price climbed to $207,894 compared to $198,567 a year earlier, a +4.7 % increase. At the same time, the inventory of homes for sale, as of September 30, continued its year-over-year declining trend, but at a slower rate, from 5,633 a year ago to 5,449 in September 2018, down – 3.27 %. However, September inventory was up + 0.5% over August 2018. “Cincinnati is considered a very affordable market for home buyers and the inventory is turning over quickly,” said Morrical. “Realtors monitor a statistic called, “Months’ Supply” (Absorption Rate). If we take the September sales and compare it to the September active inventory to see how many months of possible sales exist before there is zero inventory. For September, there is 2.6 months’ supply. 5.0 is considered a “stable market.” Below 5.0 months, it’s a Seller’s market; above 5.0, it’s a Buyers’ Market,” said Morrical. Local home mortgage rates in September averaged 4.51% for a 30-year fixed rate loan. The rates were up compared to 3.83% a year ago. At these fixed rates, the monthly principal and interest payment on a $100,000 home loan with no money down would be approximately $507. Nationwide, September home sales were down 3.4% compared to August on a seasonally adjusted basis and were down – 4.1% from September 2017. August 2018 home sales continued the momentum even though they were down slightly from last year’s levels, down – 1.14 % compared to August a year ago. Home sales this month were 2,593 compared to 2,623 in August 2017. “Home sales remain strong, despite being down slightly from last year,” said Phil Morrical III, President of the Cincinnati Area Board of REALTORS®. “This continues to be one of the best years in real estate. Sales remain robust, the average price of property has increased and interest rates remain low,” said Morrical. The July average home price climbed to $218,566 compared to $210,471 a year earlier, a + 3.85 % increase. At the same time, the inventory of homes for sale, as of August 31, continued its year-over-year declining trend, but at a slower rate, from 5,647 a year ago to 5,423 in August 2018, down – 3.97 %. However, August inventory was up +3.15% over July 2018. “Our inventory of homes continues to turn over quickly and we are less than 4% down compared to last year. Homes priced right and in move-in condition are selling quickly,” said Morrical. “Use a Realtor to assist you in selling your home or buying your next home. Realtors have access to the MLS, a powerful tool used by Realtors to assist you in listing and / or selling your home for the best, possible price,” said Morrical. Local home mortgage rates in August averaged 4.54% for a 30-year fixed rate loan. The rates were up compared to 3.95% a year ago. At these fixed rates, the monthly principal and interest payment on a $100,000 home loan with no money down would be approximately $509. Nationwide, August home sales were the same as July on a seasonally adjusted basis, and were down – 1.5% from August 2017. July 2018 home sales flexed its muscle, exceeding last year’s levels, up + 4.13 % compared to July a year ago. Home sales this month were 2,545 compared to 2,444 in July 2017. “July 2018 recorded the third highest July home sales since 2005, the highest recorded in July 2015,” said Phil Morrical III, President of the Cincinnati Area Board of REALTORS®. “Home sales remain very strong as a result of the strong economy and the steady, lower interest rates. The demand for housing has not subsided, but buyers appear to be more and more selective in what they are looking for,” said Morrical. subsided, but buyers appear to be more and more selective in what they are looking for,” said Morrical. The July average home price climbed to $224,481 compared to $209,130 a year earlier, a + 7.34 % increase. At the same time, the inventory of homes for sale, as of July 31, continued its year-over-year declining trend to 5,257 from 5,662 a year ago, down – 7.15 %, however, July was up +5.43% over June 2018.
home loan with no money down would be approximately $509. source for professional and accurate information,” said Morrical. down – 1.5% from July 2017. May 2018 home sales were strong, but fell short of last year’s levels, down – 4.32 % compared to May a year ago. Home sales this month were 2,594 compared to 2,711 in May 2017. 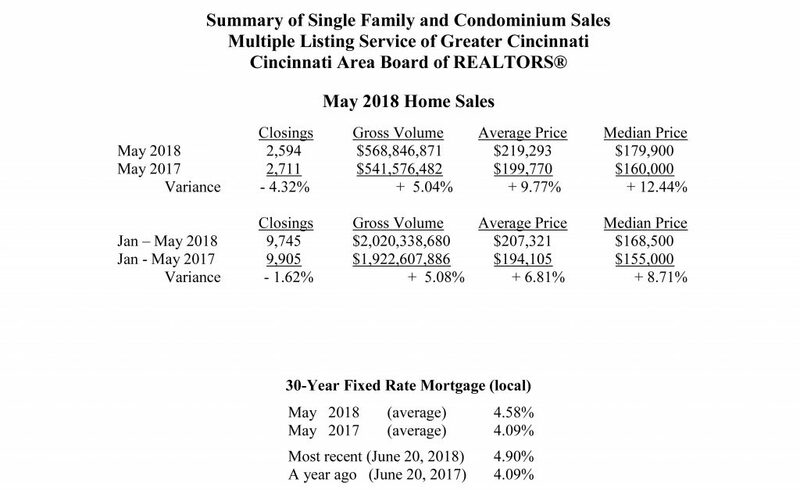 “May 2018 recorded the third most May home sales since 2005, the highest in May 2017,” said Phil Morrical III, President of the Cincinnati Area Board of REALTORS®. “Besides the strong economy, the demand for purchasing a home is very high even though interest rates are slowly rising,” said Morrical. The May average home price climbed to $219,293 compared to $199,770 a year earlier, a + 9.77 % increase. At the same time, the inventory of homes for sale, as of May 31, continued its year-over-year declining trend to 4,536 from 5,087 a year ago, down – 10.83 %. “Cincinnati continues to be a very strong and vibrant market. Our homes are very affordable even though we are dealing with low inventory and increasing home prices. Homes priced right and in move-in condition are selling quickly,” said Morrical. “A few tips for this market: 1) be prepared to move quickly; 2) make your best offer; 3) it is beneficial to come with a pre-approved loan; and 4) ask your Realtor about what price range of property is not selling as quickly. You may find your dream home by expanding your required features,” said Morrical. Local home mortgage rates in May averaged 4.58% for a 30-year fixed rate loan. The rates were up compared to 4.09% a year ago. At these fixed rates, the monthly principal and interest payment on a $100,000 home loan with no money down would be approximately $511. April 2018 home sales rebounded, exceeding last year’s levels, up + 4.00 % compared to April a year ago. Home sales this month were 2,210 compared to 2,125 in April 2017. “With April’s rebound, 2018 home sales have caught up and are on course to exceed 2017’s sales,” said Phil Morrical III, President of the Cincinnati Area Board of REALTORS®. “The strong economy and the pent up demand for new homes and first-time home buyers makes this a very active and challenging market for home sales,” said Morrical. The April average home price climbed to $214,972 compared to $205,089 a year earlier, a + 4.82 % increase. At the same time, the inventory of homes for sale, as of April 30, continued its year-over-year declining trend to 4,275 from 4,885 a year ago, down – 12.49 %. “Cincinnati is a very strong and vibrant market. Our homes are very affordable even though we are dealing with low inventory and an increase in home prices. Homes priced right and in move-in condition are selling quickly,” said Morrical. “Also, did you know that Greater Cincinnati has received recognition as a “great place to go in 2018; one of the best in the US to live and work; one of the fastest growing economies in the Midwest; and one of the best cities for new college grads? Cincinnati is truly home,” said Morrical. Local home mortgage rates in April averaged 4.58% for a 30-year fixed rate loan. The rates were up compared to 4.09% a year ago. At these fixed rates, the monthly principal and interest payment on a $100,000 home loan with no money down would be approximately $511. February 2018 home sales came on strong compared to last year’s levels, up + 3.87 % compared to February a year ago. Home sales this month were 1,478 compared to 1,423 in February 2017. “Even with interest rates on the rise and low inventory, February home sales showed strength and endurance,” said Phil Morrical III, President of the Cincinnati Area Board of REALTORS®. “We anticipate that home sales will maintain an upward momentum in 2018 due to the strong economy,” said Morrical. The February average home price climbed to $187,947 compared to $180,860 a year earlier, a + 3.92 % increase. At the same time, the inventory of homes for sale, as of February 28, continued its year-over-year declining trend to 4,027 from 4,815 a year ago, down – 16.37 %. “When you mix higher mortgage rates, new tax laws that may impact the value of higher priced homes, possible higher aluminum and steel prices and the lack of skilled labor, it’s really difficult to say when the inventory levels may level out. As long as the economy remains strong, we foresee home sales to remain brisk and home prices to remain at their current levels. With strong affordability, strong job growth, and low vacancy rates, these are great indicators of Cincinnati’s continued growth and market strength,” said Morrical. Local home mortgage rates in February averaged 4.57% for a 30-year fixed rate loan. The rates were down compared to 3.99% a year ago. At these fixed rates, the monthly principal and interest payment on a $100,000 home loan with no money down would be approximately $511. Nationwide, February home sales were up + 3.0 % from January on a seasonally adjusted basis, and were up + 1.1 % from February 2017. January 2018 home sales took a breather compared to last year’s levels, down – 8.12 % compared to January a year ago. Home sales this month were 1,335 compared to 1,454 in January 2017. “January 2018 home sales may not have been as strong as a record January in 2017, but it still reflected a strong economy,” said Phil Morrical III, President of the Cincinnati Area Board of REALTORS®. “Home sales remain strong and, from all indications, will maintain its momentum through 2018,” said Morrical. The January average home price climbed to $193,400 compared to $180,987 a year earlier, a + 6.86 % increase. At the same time, the inventory of homes for sale, as of January 31, continued its year-over-year declining trend to 4,185 from 4,867 a year ago, down – 14.01 %. “Despite low inventory and moderately increasing interest rates, a recent 2018 Housing Study by Trulia identified Cincinnati in the top 10 of 100 largest housing markets poised for growth. High starter-home affordability, strong job growth, low vacancy rates, and a large share of adult population under the age of 35 are great indictors of Cincinnati’s continued growth and market strength,” said Morrical. Local home mortgage rates in January averaged 4.22% for a 30-year fixed rate loan. The rates were down compared to 4.07% a year ago. At these fixed rates, the monthly principal and interest payment on a $100,000 home loan with no money down would be approximately $490. Nationwide, January home sales were down – 3.2 % from December on a seasonally adjusted basis, and were down – 4.8 % from January 2017.